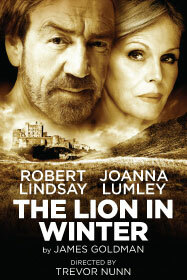 Last chance to see THE LION IN WINTER at Theatre Royal Haymarket - Extra performance added! Trevor Nunn’s production of James Goldman’s The Lion in Winter will complete its run at the Theatre Royal Haymarket on 28 January 2012 as previously announced. An additional matinee performance has been scheduled for Tuesday 24 January at 2.30pm. With a cast led by Robert Lindsay (Henry II) and Joanna Lumley (Eleanor of Aquitane) who are joined by Tom Bateman (Richard), Sonya Cassidy (Alais), Joseph Drake (John), Rory Fleck-Byrne (Philip) and James Norton (Geoffrey), set and costume designs are by Stephen Brimson Lewis with music by Steven Edis, sound by Paul Groothuis and video design by Ian William Galloway. A family Christmas becomes a family at war. Henry II, not so young as he was, invites his estranged wife Eleanor of Aquitane, and his three sons, Richard, Geoffrey and John, to spend the festive season with him, his mistress Princess Alais, and her brother, the young King Philip of France. Will Henry name who is to be his successor as King of England? Their yuletide celebration turns into a combat zone of deceit, betrayal, bitter power games and scabrous wit. Trevor Nunn’s opening production as Artistic Director of the Theatre Royal Haymarket Company was Flare Path. This was followed by Rosencrantz and Guildenstern Are Dead. Nunn’s production of The Tempest starring Ralph Fiennes completed its run in October 2011.